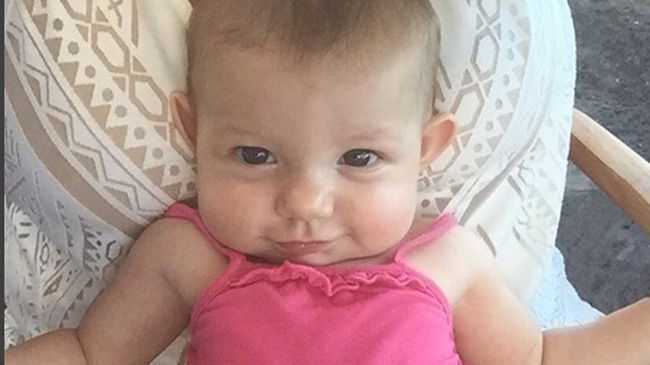 HAYLIE Duff has shown off the first picture of her baby daughter. The 30-year-old star and fiancé Matt Rosenberg welcomed little Ryan into the world in May and after previously teasing fans with images of the little girl's legs, she has now shown her in full for the first time. She captioned the picture of Ryan, who was wearing a pink bathing suit: "Baby's first vacation." She then followed up the picture with a second image of the tot's face. Alongside it, she wrote: "Our sweet baby girl #RyanAvaErhard Rosenberg is 16 weeks today (sic)"
'The Real Girl's Kitchen' star was recently praised for her parenting skills by her sister Hilary Duff. She said: "She's doing great and I'm so proud of her. "She's really a natural mom." However, the 27-year-old star - who has three-year-old son Luca from her previous marriage to ice hockey player Mike Comrie - did admit there is one thing her big sister is not so good at, as she regularly calls her up to help wrap up the newborn baby. She said: "I've been there a lot. I give a mean swaddle so [Haylie's] always calling me like, 'Come over here! Give this baby a swaddle'. It's really fun to have a new addition to the family."